1. EFL Series: What a dollar can do! I have learners of all ages but this lesson came to me after surfing the net looking for things to put on one of my Pinterest boards. 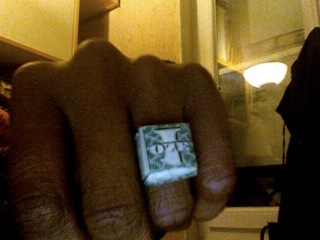 I ran across a picture of a ring made from a dollar bill. 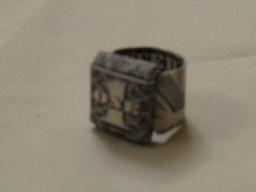 I then set out to find a clear and precise video explaining how to make this ring dollar bill ring. 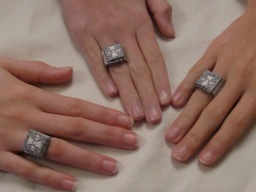 I just knew that this would be an interesting successful lesson to motivate three students that I teach in a group. Finally after a thorough search on You Tube I found someone explaining how to fold a dollar bill into a ring. I’ll link the video below. Firstly, I made a list of important words needed to follow the instructions to fold the dollar bill. Keeping in mind these key words can be used to fold origami as well as be used to express other everyday ideas. Since these students are 12 and 13 I tried to make the list of words short and sweet. Here’s the list I used: crease, fold, edge, tuck, lift up, corner, faint, layer, pop outward. The last word pop outward is a little complicated but it was better to show them what it meant to avoid any comprehension problems. I made a definition worksheet which contained these words and their meanings in English that they could keep for future use. You can also illicit other ways we use these words and maybe your learners will ask what they mean like mine. One asked “What does you’re living on the edge mean?” You can explain what it means to be tucked in at night. you can ask your learners if they have ever felt faint, etc. crane, which you can see below. Voilà, you have an easy, fun, original, and certainly entertaining English lesson. For a longer lesson you can replay the video and go over what was said and explain any vocabulary or expressions not understood. Give it a try and have fun teaching while your learners are having fun learning! Author didibooksenglishPosted on January 16, 2012 Categories Teacher in ProgressTags dollar bill, EFL, expert teachers, origami, origami crane, Pinterest, teaching, You Tube6 Comments on 1. EFL Series: What a dollar can do!